With the trains (but not trams and other local transit) shut down on Tuesday, we were limited to Helsinki. 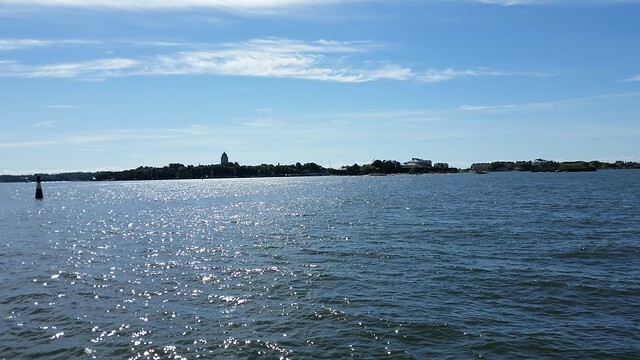 However, that's not really that big a limit, and we had made our plans today to visit Suomenlinna, the former fortified island in Helsinki harbor that is now a UNESCO world heritage site. 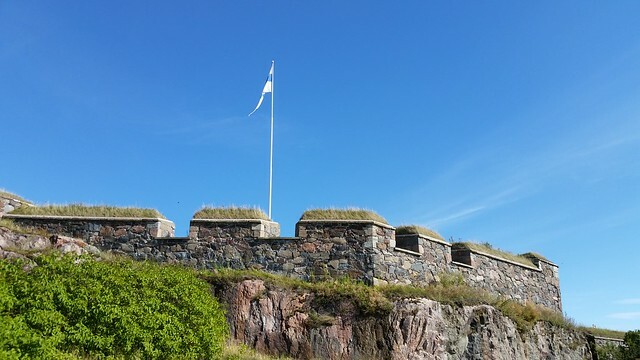 This was where we eventually ended up, where the Finnish flag still flies over the island's fortifications. But first we had to get there, by tram and ferry. I bought two-day transit passes for Lisa and me, which includes not only trams and buses (and the trains if they were running, which they were not), but also the municipal ferry to the island, which runs every 20 minutes at peak. Aside from a misadventure on the way there with me getting us off at the wrong stop, then overshooting the correct stop once we corrected the first error, it was not a problem to get to the ferry. Here's a view of the island at we approached on the ferry. The island is not that large, but just walking from end to end consumed most of the day. 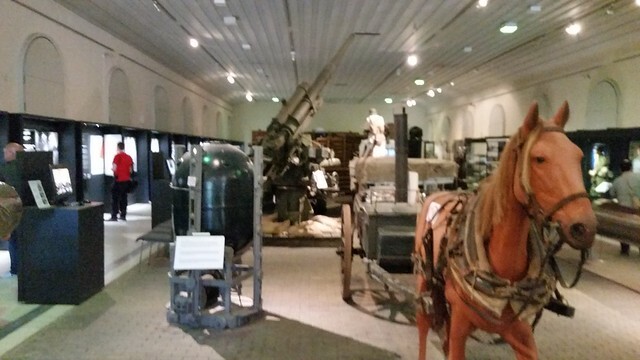 We stopped first at the Military Museum, which traces the history and current state of the Finnish military forces. 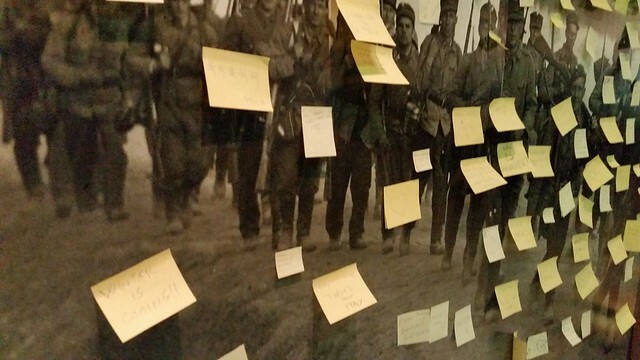 I was amused by this display where people were encouraged to leave messages. Check out the message at the lower left. I don't think Lisa and I were the first members of Worldcon 75 to make the visit to the site this week. 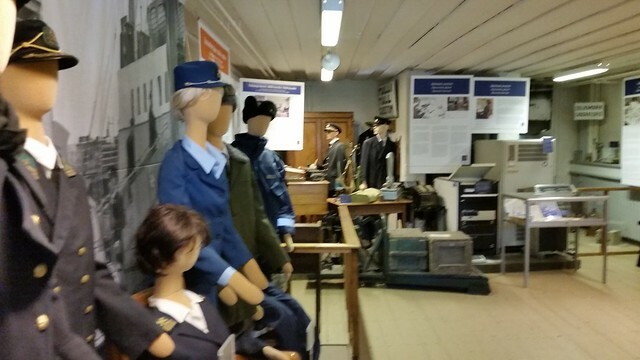 The admission to the Military Museum includes admission to the display of Finland's only remaining submarine. 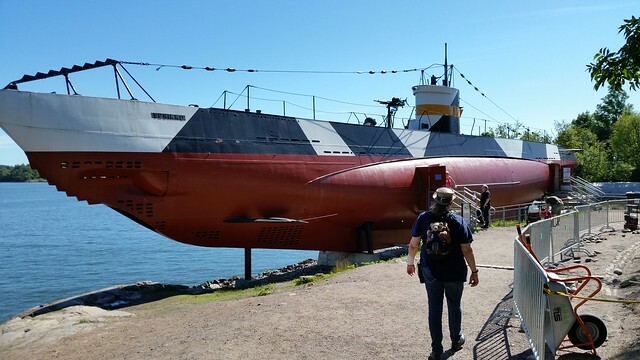 In the post-WW II settlement, Finland was prohibited to have submarines, and this one remaining example is maintained as a museum boat. The island has also been used as a customs post, and the Customs Museum (no admission charge) recaps the history of the country's customs service, which predates the independence of the country itself. Eventually, after stopping for lunch about halfway across the island, we made it to the King's Gate at the far end and started heading back out. There were other things we could have done on the island such as the Toy Museum, but by then we were getting pretty tired, so we did a relatively quick return trip, stopped at the grocery store and got some drinks, and boarded the next ferry back to the mainland. 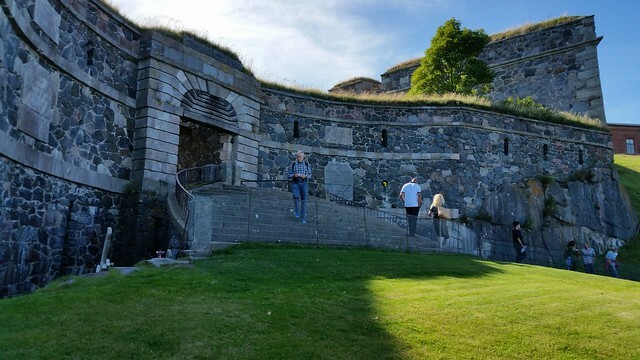 If you're interested in the full set of my photos from today's island-hop, I created a Suomenlinna album on my Flickr site. Coming off the ferry, I was seduced into buying an a fruit-filled crepe from one of the vendors in the Market Square. I told myself that I'd already walked 12 km today and had earned this one; besides, it was the fruit-filled version and I didn't add the ice cream. I classed this purchase in the same way as my buying an elephant-ear pastry when in Seaside, Oregon. Lisa and I walked back toward downtown through the Promenade area, eventually finding ourselves in Stockmans Department Store, where Lisa did a bunch of shopping but did not find anything she wanted to buy. Among other things, she was looking for an electric kettle that was not Made In China, even if it meant wiring a 220V European plug into our kitchen. Alas, this quest was unsuccessful. Apparently while the train drivers strike ended at 1800 today, regular rail service will not resume until tomorrow, so we hopped on the #9 tram and started heading "home" to where we've spent the last eight nights. There we had an important but mundane errand: laundry. We dug out everything, packed it into the oversize zipper-locking plastic bag I brought partially for this purpose, and got back on the #9 to go to the S-Market and the 24 Pesula coin-laundry. We used the larger €18 washer to do everything in one load. An hour or so later, we had clean, dry laundry and a small number of additional groceries, and we set off back to the hotel. At the hotel, we started the initial round of re-packing, putting away as we could the stuff that we will not need until we get home or at least until Iceland, and confirming to our own satisfaction that we aren't going to exceed our luggage capacity. If we bought too much, we have the option of buying another piece of luggage, which we can do because our homeward luggage allowance is more than our outbound, thanks to using points to fly in IcelandAir Saga class. Fingers are crossed, however, that we can make it all fit for the trip back. We have one more full day in Helsinki, but we need to not stay out so late, because the flight out on Thursday is much too early, requiring an early departure from the hotel to get to the airport sufficiently early. One final note. Lisa was wearing a Worldcon 75 t-shirt while we were riding the tram back to the hotel. A woman sitting next to us with her daughter in a pushchair noticed the shirt and told us she had been to Worldcon and that it was her first-ever science fiction convention. She had been there with both her children, and the older one participated in Children's Programming. All of them enjoyed the convention immensely, and they hope to be able to come to Dublin in 2019. After all of the negative things I've heard from some people, I'm very happy to hear good experiences of people like this. We all were first-time attendees once, and I started my adventures in fandom at the largest Worldcon (by attendance) ever held, so I hope that many of the people who started with the largest Worldcon ever held in mainland Europe also have the positive feelings toward Worldcon that I have.